Pteridophyllum racemosum (Papaveraceae) - if ever anyone wanted a mini collection, this should be it as there is only one species. It is a strange and rare woodland perennial from the mountains of Japan. The evergreen foliage looks like a clumping fern until the 10" scapes of white flowers bloom in summer. 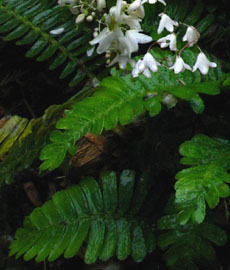 I grow two different forms : one prostrate fern-like leaves appearing well before the flowers; the other flowering from the centre over still-green old leaves. 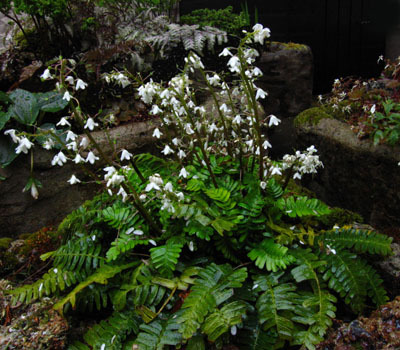 Grown here in a trough in full shade in the company of other dwarf shade-lovers and it thrives as this 10 year-old plant can testify. Acid soil enriched once a year with Vitax Q4 in a top dressing.